Life Before the Dinosaurs: Parexus. 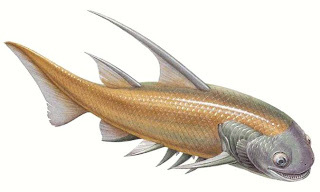 Parexus was a bizarre acanthodian with a large spine in front of its dorsal fin. Like all acanthodians, like Climatius, Howittacanthus, and Gyracanthus, it had a spine in front of each fin. A very good adaptation if something is going to be near the bottom of the food chain. Acanthodians were small compared to the sharks and placoderms that they were living with. 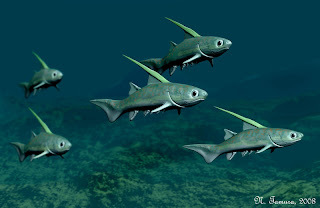 Acanthodians, also known as "spiny sharks," appeared in the Ordovician and died out somewhere in the Permian, but definitely not at the end or near the beginning. Parexus was 6" long. A variety of acanthodians were 6" long, like Climatius. Parexus was from Britain, like Climatius. Acanthodians, like true sharks, lost old or damaged teeth and then new teeth grew in the spaces where those old teeth were.